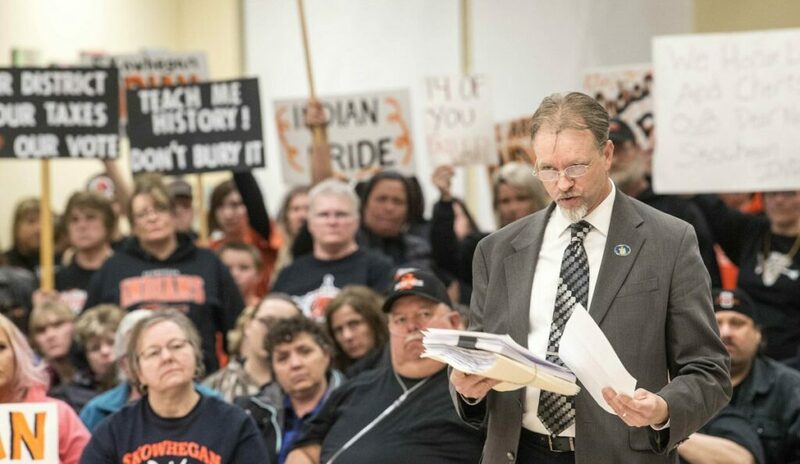 Residents who support Skowhegan Indian Pride are trying to overturn the board's 14-9 vote to retire the nickname used for the school district's sports teams. SKOWHEGAN — Supporters of keeping the Skowhegan “Indians” nickname for School Administrative District 54 teams turned out in force at a school board meeting Thursday night and asked that the issue be put to a referendum vote. As police officers stood by, supporters decked out in “Indian Pride” black and orange and displaying signs and shirts burst into a loud chant – “We are the Indians, the mighty, mighty Indians” – before the meeting even began. The SAD 54 board met to update the planning process following its 14-9 vote on March 7 to “respectfully retire” the “Indians” nickname for all schools in the district. 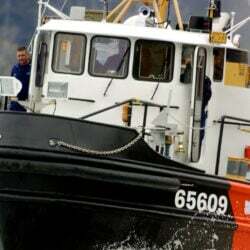 The Skowhegan-based school district was the last in Maine to stop using the Indians nickname, making the state the first in the nation to remove all Native American imagery and names from school sports teams, the American Civil Liberties Union of Maine said after the vote. However, not all members of the SAD 54 community were happy with the vote, and many began assembling in rallies to gather petition signatures to revisit the question, saying residents and students should have their say. Others said the 23-member school board is elected as the voice of the people and that the final vote had become district policy. Board Chairwoman Dixie Ring of Canaan allowed four people to speak Thursday night. On the other side, Cynthia Soma-Hernandez called for calm and asked for an initiative to select a new mascot now that the vote was taken. She said a systemwide competition to select a new mascot would empower the student body. On March 10, about 50 people showed up downtown in front of the iconic Skowhegan Indian sculpture to gather signatures calling for the vote to be revisited, and there were subsequent rallies and petition-gathering efforts. Sporting the black and orange “Indian Pride” garb, the group huddled in front of the sculpture donated to the town in 1969 by Maine artist Bernard Langlais. It was a call to action, said school board member Todd Smith, who passed out fliers while others distributed petitions to be signed. The contacts listed on the flier included school board member Jennifer Poirier, the founder of the Skowhegan Indian Pride Facebook group. “I’m not sure I understand the point of the petitions other than that they demonstrate that there are board members who refuse to uphold and implement a decision that didn’t go their way,” Savage said Thursday night. Savage said there were opportunities for the public to make their wishes known to the board, including a public forum on Jan. 8 during which many district students and residents spoke in favor of the change. Debate has raged in and out of SAD54 school board meetings since 2015, when it voted 11-9 to keep the name, saying that the word “mascot” was a misnomer, as the district had dropped all the feathers, warpaint and characters years before. Passing out petitions on March 10, “Indian Pride” supporter Kenny Steward of Skowhegan said their side of the story hadn’t been told. “My hope is that the board will see the outpouring of local supporters and put it to the voters of the district in a referendum vote with the budget vote,” said Todd Smith, the school board member from Skowhegan. “The ‘changers,’ as they have been labeled, say it’s bad for students’ learning, and members of the board indicated it’s our job it to look out for the children. In this case, it’s so many parents of the children we are working for telling us we aren’t doing a good job because of this vote to change. 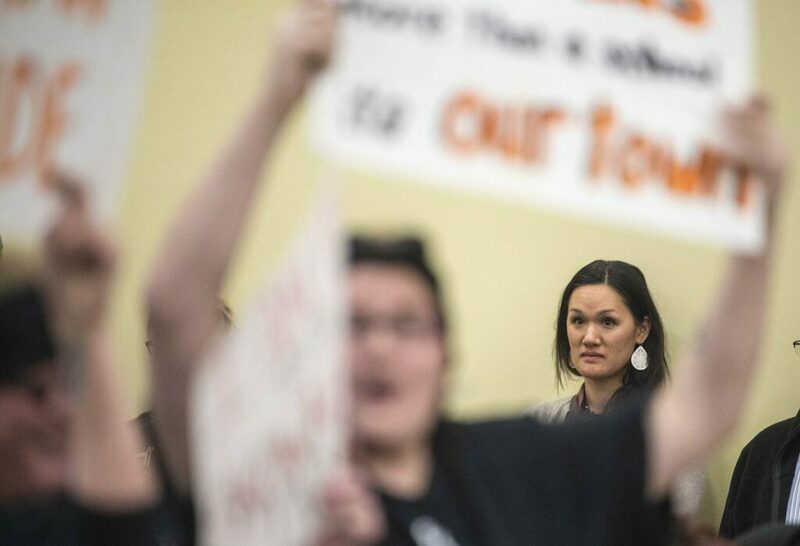 Maulian Dana, the ambassador of the Penobscot Nation who has spearheaded the “mascot” removal effort, said she did not plan to attend Thursday’s meeting, preferring to concentrate on the proposed bill to ban all Native American imagery for school sports teams. She said the issue at hand is just that – school mascots or nicknames – not the town seal, as some have suggested, or the Bernard Langlais sculpture of the Skowhegan Indian downtown.